It was a perfect day to have our fern class out on the deck of the studio. 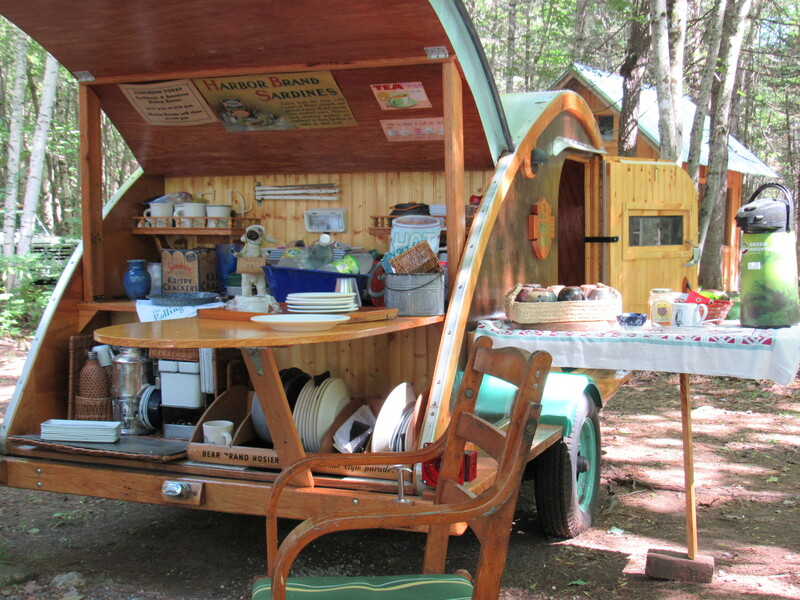 We set up the teardrop trailer for serving tea and scones and chocolate croissants. A lovely Sunday spent looking at green fronds and fern spores. A walk around the gardens and then into the woods for a little exploration. As we ease our way into fall and cooler days, the ferns continue to grace the landscape and the woodlands with their waving tendency and emerald hues. Lovely, lovely, I must say. 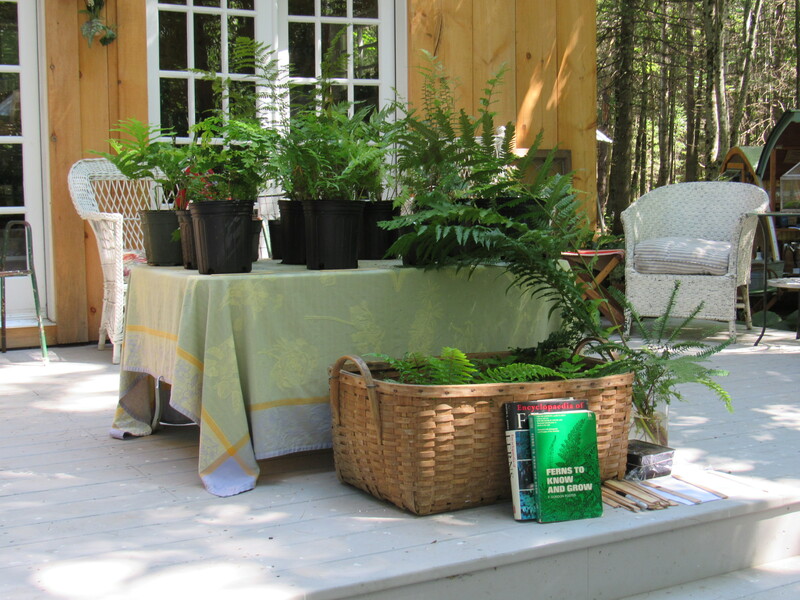 There is a natural swath of New York ferns (Thelypteris noveboracensis) leading over to one of the cabins we have. In the spring the forest floor is covered with a blanket of false lily of the valley (Maianthemum dilatatum) and the combination of these two plants is quite extraordinary. Of course, in May, the false lily of the valley is in bloom, their fragrance sweetening the forest air. Divine. Nature surely has the patent on landscape design, don’t you agree? We are still plenty busy at the nursery with late-season chores and plantings. Customers are continuing to come knowing that they have time for changes and additions to their gardens. It is this time of year, however, that I feel a pull to roam…to roam the woods, to roam the rocky seashore, to roam the footpaths and mountain trails. I think it’s an attempt to catch my breath. A busy summer, a wedding to plan (and still to pull off), visits from our kids and grandchildren, and, also, of course, the day to day work that keeps the nursery afloat. The urge to slip into the woods, to go deep into the wilds, to sit still among natures green growth and tree canopy, is fierce at the moment. Lately, regardless of how late it is, I’ve been driving over to the lake ( just a mere mile, thank goodness) to a little-undetected spot and swimming. Sometimes it’s just before bedtime. The lake is quiet and the night sky reflects on the surface, I don’t see anyone else. It’s nice, it’s serene, it’s really quiet. I slip into the water like a seal and let the coolness soothe my soul. So restorative. Perhaps this is all the natural progression of a season winding down and I myself feel its influence. Many plants are leaning toward dormancy, the leaves on the trees are losing their chlorophyll, the deer are in the corn fields fattening their bellies for what’s to come. My own inner clock is searching for a different rhythm. I like that. I like the space in the day to be a little more reflective, I like wading into that big beautiful body of water, floating on my back, looking up at the night sky, and being able to hear the beat of my heart. Again, restorative. Hope you are all finding those moments to soothe your soul with an activity or a space that allows for stillness. It’s worth the search and for me right now…essential! Thank you, Wally. It has been a busy busy summer and now I am feeling the great instinct to wind-down. Hope you are well! The you gifted us continues to give me the greatest pleasure. Especially those primula…I covet each and every one!! and such a beautiful studio building! Oh, that studio, don’t I love tucking away in there and crafting…..or even procrastinating about crafting ( which I can often be found doing!). Reading that brought me to tears. You have always had a way with words. I can feel so much heart and soul coming through. And I smile when I picture you as you described. 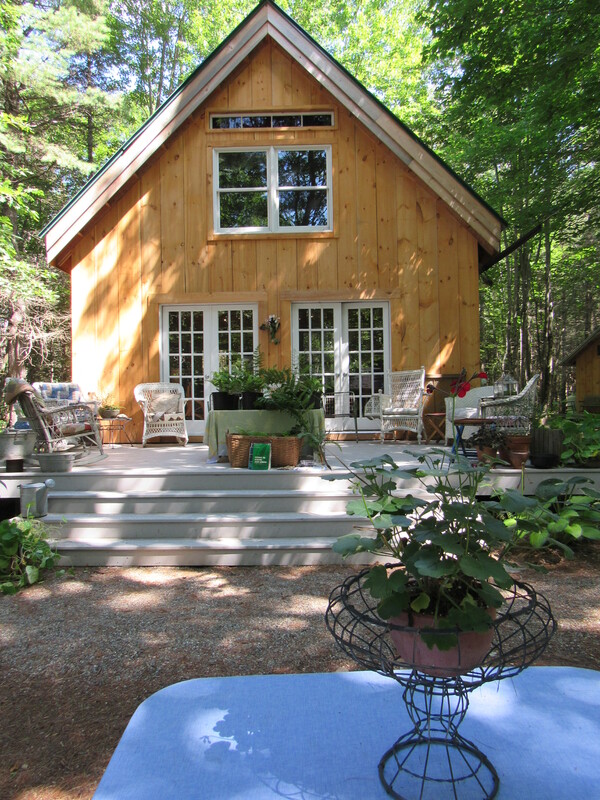 Such a lovely footpath to walk…and it heads right over to the cabin Noah built. So a very special walk, indeed! love you, Sharoney! Maianthemum dilatatum, or ‘false lily of the valley’ which it is often referred to, is a native woodland plant. It does resemble the typical garden variety of lily of the valley, Convallaria Majalis, hence how it came to have this name ‘false’. It grows through the woods as a ground cover and blooms in late May. It just so happens that a large patch is growing alongside the New York ferns on the way to one of the cabins, quite lovely with the dappled sun filtering through and accentuating both the plants. I really wish I could grow the real lily-of-the-valley here. The air is too arid. They can do well in the redwood forests, but not down in the Santa Clara Valley where they belong. So many of the understory plants from New York and New England would not be happy here. They might survive in the climate of the redwood forests, but not many plants like living with redwoods. Your description of the nighttime swim almost makes me want to put on a swimsuit and go out in the lake for myself! Then I remember I don’t even own a swimsuit, the lake is kind of low and icky on the edges, and I’d probably get hit by a jet ski. But I still like the image you create! Those swims at dusk sound magical. As for ferns…we are surrounded by those green beauties here at our house. We love them! Your new studio looks wonderful! I am hoping to stop by later this month for a walk about the nursery and maybe pick up some new treasures. Hope you’ll be there!! I know you are so busy right now but all that talk of fern glens and lakes swimming on a hot night sounds like paradise. And your studio and trailer look so beautiful!!! What a wonderful place you two have created.